Thank You to everyone that participated in our Meet the Candidate event. Here at DeLand Pride, we feel very strongly that local elections are just as important, if not more important, as national elections. 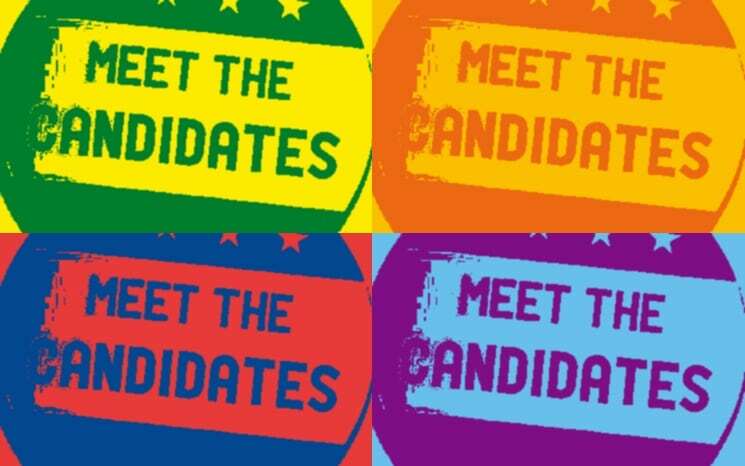 That is why we have put together this event to showcase our local political races and give our community an opportunity to meet and get to know the individuals asking to represent them in the political arena. This is an equal opportunity event open on a first come, first serve basis. No candidate, regardless of party affiliation, will be excluded as long as they are approved by the Department of Elections and have submitted the requested information. Participation in this event does not indicate endorsement by DeLand Pride. Each candidate was asked their stance on each of the proposed amendments and their thoughts on 5 hot button topics. Their responses are below. What is your stance on Gun Control? Please include your thoughts on background checks and limitations on weapon types. I stand for a general ban on assault rifles. This means semiautomatic firearms that have a large magazine and have been modified for rapid fire and combat use. The implementation of universal background checks to keep criminals from purchasing guns, and expansion of mental health screenings are things I firmly believe in. Every gun purchased should be subject to a comprehensive background check. In addition, individuals on the federal No Fly List would be prevented from purchasing a firearm. I stand for common sense gun control. What is you stance on the Affordable Care Act and Healthcare Reform? The Affordable Care Act is not exactly affordable or accessible to a large percentage of American citizens. The policy reform for Universal Healthcare--via Medicare for All--needs to be sponsored federally to cover all Americans. We need to expand funding for generic pharmaceutical drug creation needs to be pushed to lower prices. Also, the funding for community health centers should be increased so under served communities have better access to treatment. What is your stance on the Florida Education System, its funding, and Education Reform? I support the Florida Education System, as I have attended public school here, and send my two children to public school in the district. The education system has been flawed for some time as a result of No Child Left behind. Under this policy, children with mental health or behavioral issues are passed on to the next grade level even though their abilities don't allow them to transition vertically in a conducive nature. The issue of restorative justice within the school system, pertaining to out of school suspension, directly adds to the path toward jailing. The arming of teachers should not be allowed either. What is you stance on LGBTQ Rights? Please include your thoughts on public vs private sector discrimination based on sexual orientation or gender identity. I stand with the LGBTQ community as they fight for equal rights. Specifically within the public sector, the rights of the community are still discriminated against within the work place. I will work to repeal exploitative policies such as sexual orientation discrimination in the workplace. Within the private sector, the religious community is extremely discriminatory towards the LGBTQ community, and we need a voice in Washington that will draw attention to this problem. Talk briefly about the Volusia County Economy. Please include your thoughts on the problems and possible solutions to those problems. The Volusia County economy is based on service oriented jobs. We need to invest in infrastructure projects that will encourage more manufacturers to relocated to the pivotal I-4/I-95 corridor. Jobs based on infrastructure projects manufacturing and servicing the space industry is how we are going to improve the economy of Volusia. Finally, the climate emergency and the need to expand the middle class demand that we make the most ambitious investment in American infrastructure since we created the interstate highway system. We will put Americans to work updating and expanding our roads, bridges, public transit, airports and rail lines. As a Realtor I know first hand how education impacts communities. I am appalled that we do not prioritize the children, teachers and those who keep them safe. Our prioritize need to change, when we have high achieving schools there is less crime, higher home values, better living wages and a better quality of life for all. Put all the lottery funds toward education as promised. LGBTQ rights is human rights. As a women and person of color I know first hand about being seen as different. You do not have to agree with someone to treat everyone the way you want to be treated without judging. Everyone has the right to be who they believe. I look forward to a time when labels are not necessary. I am concerned that Volusia county priorities have not been focused on the essential services; Sheriff, Fire, EMT, Waterman and other first responders. There are issues with response time due to under staffed and resourced. Review and prioritize the roles that we need to make us a priority in the time of need. I am concerned about the limited amount of county dollars spent in West Volusia. The beauty and challenge is each city or township is a unique gem with varied needs. I look forward to collaborating with municipalities to identify and address common concerns for the county and consider specific needs. About the above Amendments. Generally I do not support bundled amendments to our constitution. They often force you to take the good with the bad, like vaping and offshore drilling. These are recently released and I will take more time to study them at which point I may withhold my support for some or give support for others. This is to important for superficial decisions. On gun control it is clear the US Constitution protects our natural right of self protection and for protecting our property and family. We already have significant background checks. What we don't have is a government capable of conducting these checks accurately. It should be done by a private agency who would also screen for mental health. I do not support any restrictions on weapon types or ammo. I also do not support gun free zones as they are targets for those who want to harm other. However business should have the freedom to allow firearms in their establishments or not. Then let the market decide who to support. Schools should also not be gun free zones. It is not fair to deny a public school employee their right to self protection. We could prevent school shootings in Volusia County if volunteer teachers or staff members were well trained by our VCSO to carry concealed and have taken the sheriffs 500 hours of training. We need to stop punishing law abiding citizens for the crimes of a small minority. The ACA is a terrible failure resulting in increased costs and availability for health care. Our government does not do much well or efficient. I do not trust or support the government having any roll in my healthcare. That is why I am working with local medical personnel and other individuals to create a far better option, at lower cost than current welfare, with much higher quality for the poor and ANY other family that wants to enroll in a low cost private medical service. We will offer it to residents of West Volusia first and then make it available to the entire county and even the State. Our model is a proven success embraced by families around the country. It is exciting and you will love it. FL education system is rated 29th out of the 50 States. Not acceptable. Teachers have an impossible challenge teaching to a test, with little to no discipline in a system that is so top heavy with administration there is little money to reward good teachers. The confusing new role of outcome based education at the expense of proven techniques for teaching reading, writing, and arithmetic has been another failure. We need local control of education with better communication and honesty between teachers and our county managers office. Our current County Manager, Jim Dinneen needs to be terminated as he has proven to be untrustworthy in his communications with many employment groups in our county. Discrimination is wrong wherever it is applied. The government has no constitutional authority to have any control or licensing for any marriage. It is none of their business. It is a matter for a couple who loves each other and is committed to a lifetime relationship to decide if they want to be married. It is between them, God, and their family. I am against government licensing of ANY marriage. Marriage is essentially a religious agreement and we should be happy to let God handle it. Discrimination can not be tolerated in the work or public environment. Discrimination based on sexual orientation should not be tolerated in the public environment nor should participation in another's personal choices be forced on other individuals or businesses. We are American's first and it would serve our county, state and country well to get along and just love each other. Volusia County suffers from ED. What our elected public servants and county management refer to as Economic Development is in reality Economic Embezzlement. This policy of corrupt corporate cronyism must be halted in Volusia County. Corporate welfare has resulted in a depleted tax base with special favors going to a select few campaign contributors at the expense of every other taxpayer. Volusia County needs new spending priorities that benefit every taxpayer and provides a good business environment for the small businesses that keep our county moving. Instead of decisions that benefit a limited number of special interests with single projects, spending should be focused on those things that benefit every resident, visitor and business. We should be investing in good roads and infrastructure that reduces congestion. We need to decide where we want to allow construction and where we want to preserve green spaces for everyone to enjoy. There should be an immediate ban on further construction in our wetlands and water recharge areas. This unchecked development is harming our aquifer and jeopardizing our source of clean drinking water. There needs to be a priority focus on public safety.instead of limited services that endanger the lives of our first responders and place our citizens in danger. Education must be a priority. Then instead of offering bribes for businesses to come to Volusia County lets promote our great environment, good roads without gridlock, well financed public safety that is ready for our growing 55+ population and well maintained and easily accessible beaches, parks, springs, rivers and recreational facilities. Let's make Volusia America's Favorite place to play and work just like DeLand has been transformed to be America's favorite downtown. Supreme court ruled states can not ban gay marriage and I support the law of the land. We need to address hiring, staffing and retention to ensure our basic service levels are maintained during this period of growth, e.g. the new has been focused on the county medical examiners office (morgue) but every department including EVAC is suffering from shortages and impacting service levels. We need to bring impact fees in line with inflation so the cost of growth is borne on everyone, not simply the existing taxpayer. I only support sales tax if it's revenue neutral for municipalities--must be equally offset by ad valorem cuts. Enforcing current laws on the books would be the first step in improved gun control - I believe that gun safety training an essential part of owning a firearm, learning the proper way to store and use a firearm is needed before one owns a firearm. The health care system is broken - the Affordable Care Act is not capable of fixing the current issues. Florida Education System is lacking, funding continues to lag behind other states and the focus on testing continues to be a problem. Everyone deserves the same respect and dignity. Volusia County continues to benefit from a growing economy, however, years of stationary impact fees have created a void in resources need to sustain that growth. Particularly in DeLand, we do not have the resources to keep our infrastructure in proper care, we are at a point where we need to examine all options. While the Supreme Court opinion in District of Columbia v. Heller struck down a ban on some aspects of private handgun ownership particularly in the privacy of one's home it does NOT prohibit states from enacting reasonable restrictions on purchase, licensing, carrying and use of firearms in general, nor does it prohibit reasonable restrictions on certain types of firearms. I have handled multiple homicide/shooting/assault cases over the years and have seen more than my share of autopsy photos. I favor reasonable restrictions designed to limit clip or magazine capacity, firing capability, improve background checks, etc. and I am encouraged and delighted to see young people start to grapple with these issues in a meaningful and thoughtful way. As a former teacher I most certainly do not support the notion of arming teachers in schools, any more than I want to see armed theatre and shopping mall employees. I support those with military and law enforcement training being licensed to carry, but I do not think I possess the knowledge, skill, temperament or training to "pack heat." I have been self-employed for the past 35 years; I have had significant pre-existing conditions due to a motor vehicle accident. I understand how difficult and unaffordable it is for many to obtain quality healthcare, and I think that is inexcusable for the greatest country on the planet to fail to provide basic coverage for all of our citizens. We need to examine healthcare delivery systems all over the world and start implementing what works in our country, even if that means scrapping some of the profit-generating aspects of our system. On the bright side, it looks like I will probably survive one more year and finally be eligible for Medicare when I reach age 65. I hope the rest of you live long enough to benefit from this single-payor system, too! The opportunity for every child to obtain a high school education in a public school put this country ahead of all others through the 20th Century. To continue to excel and compete in a changing world, we need to recognize that we can no longer stop at the 12th grade level and need to provide at least 2 years of college, vocational training, apprenticeship training, or the like. We need to honestly address issues of behavior and performance and stop blaming teachers and schools for the failures of parents. My son had the "Talk" with me and explained that there is no "gay" or "straight", but instead there is a spectrum of behavior, preferences, choices, etc. Whether it's a matter of sexual preference, political or religious belief, ethnic background, or whatever-- everyone is at their own position on the spectrum of life. That position is also not fixed, but can change over time and due to circumstance, and is certainly not completely understood by anyone else. I think my son is wise beyond his years. We should all be judged by the content of our character, by our intentions, and by whether we leave the world a better place for all others. Viewed in that context, where one falls on the "spectrum" is irrelevant. An economy thrives and grows under conditions of stability. The judiciary plays a role in providing this stability by uniform, predictable, fair and impartial application of the law. Having given the bland, acceptable answer in writing, I look forward to making a blistering commentary Thursday night on some activities taking place in out court system today that I believe are a real drain on the state's economy and on the finances of every person who drives or owns a car in Florida. I believe there should be comprehensive background checks before anyone is able to purchase a gun. I think only the military should have access to semiautomatic weapons and large capacity ammunition magazines. I do not agree with teachers carrying guns on campus, especially K-12 campuses and I do not like open carry laws either. This issue is near and dear to my heart. Not only have I lost a child, but my youngest also has cystic fibrosis. This is a very costly disease, which involves a lot of durable medical equipment and medications to keep her healthy. The Affordable Care Act hurt my family financially because it lowered the amount individuals can place in Flexible Spending Accounts to pay for hospital visits, medications, etc. Despite this, I am in full support of everyone having access to affordable healthcare even if that requires expanding Medicaid and Medicare. I am terrified what will happen if insurance companies will no longer be required to insure individuals with preexisting conditions. Sadly, it would be a death sentence for many people. Florida has not adequately funded education for years. The state legislature consistently enacts unfunded mandates, which gives school districts little control over the remaining funds. It oftentimes creates environments of difficulty paying teachers what they deserve. Education reform is frightening in some respects to me. School choice is one of the biggest issues with education reformers. With school choice comes the voucher system and charter schools. While sounding good on the surface, it allows school funds to be stripped from public schools and placed in the hands of institutions where there is little oversight and accountability. These programs have become a way to racially and economically segregate our schools. Our state legislature is also actively trying to remove the decision-making authority from local school boards and give full authority to themselves when very few legislators have any acquaintance or involvement with public schools. I support LGBTQ Rights. I strongly support equality in all aspects of life and that discrimination based on sexual orientation or gender identity should not be allowed in the public or private sector. The biggest challenges for the Volusia County economy is bringing in new businesses, poverty, funding infrastructure projects, and our environment. Attracting businesses that will provide higher paying jobs would be the easiest solution for economic growth. However, we have so many families living in poverty that transportation seems to be one of the most difficult obstacles. It is difficult to get to a job if there is limited public transportation. On a positive note, our county is fortunate to have many philanthropic organizations which help our homeless population. If our state returned more of our sales tax revenue that we send to Tallahassee, we would be better able to fund more projects. Not related to my sought position. Not related to my sought position. But, I would like to see education to cover history as it happened and not through the lens of an acedemic. We can create more local wealth by nurturing and using our local resources, vendors, businesses. Urban or local farming helps the local economy. Gardening helps individual economy and health. All responses are included in their entirety as submitted on our online registration system. There has been no alteration or adjustment for spelling, punctuation, grammar, or formatting.